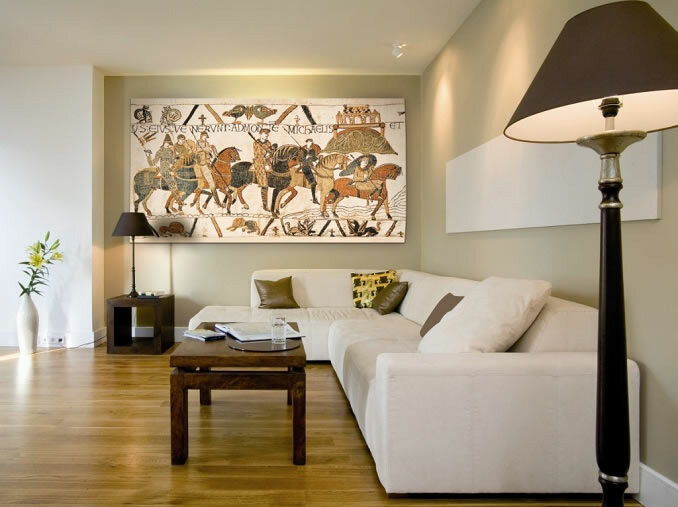 Medieval tapestries work very well in contemporary areas. 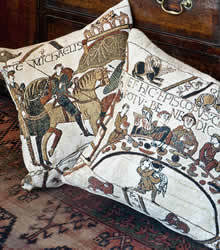 This section of the tapestry depicts Duke William, accompanied by Earl Harold, setting out on a military campaign against Duke Conan II of Brittany. Passing Mont St Michel off the coast of Normandy, they ride to the town of Dol. 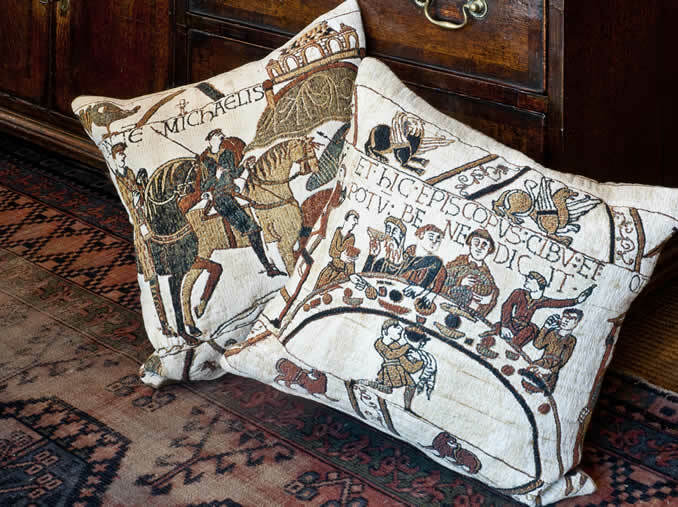 The Latin test reads “HIC WILLEM DUX ET EXERCITUS EIUS VENERUNT AD MONTEM MICHAELIS” which translates “Here Duke William and his army came to Mont St Michel”. Contact us for more information regarding this tapestry. 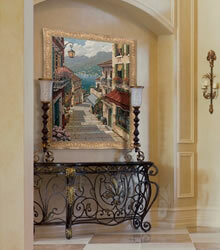 This tapestry features the village of Bellagio on the shores of Lake Como situated admist the foothillls of The Alps in Northern Italy. Called the "Pearl of the Lake", Bellagio is famous for its beautiful panoramas. 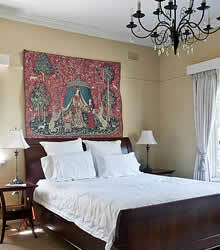 The village itself is characterised by centuries-old buildings, stone lanes and picturesque cobbled stairways. 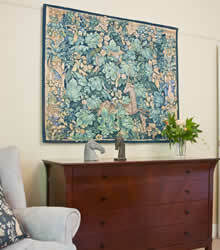 The Romans first introduced the olive tree and the laurel which are found in abundance on the shores of the lake. 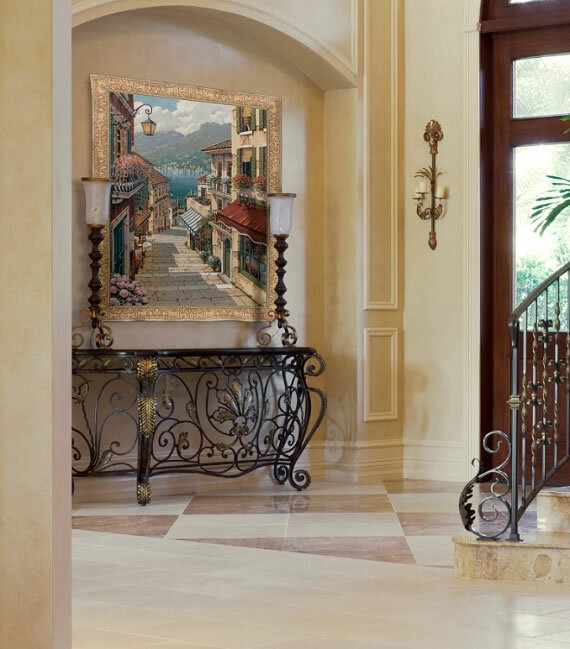 Bellagio's beautiful and strategically important geographical position has determined its importance in history. 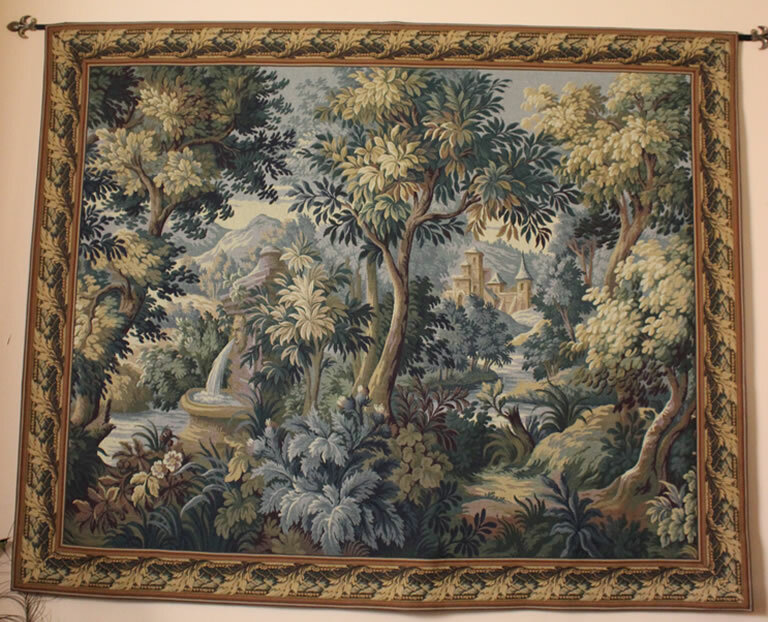 Many other Italian and French scenes are also available from Classic Tapestries. 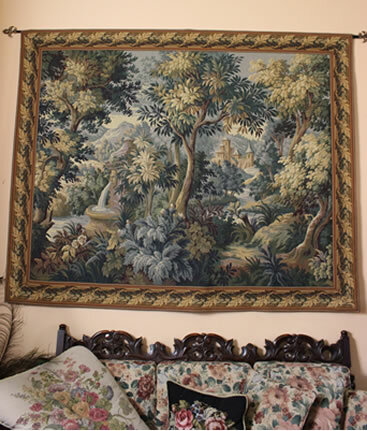 Contact us for more information on this tapestry and others. 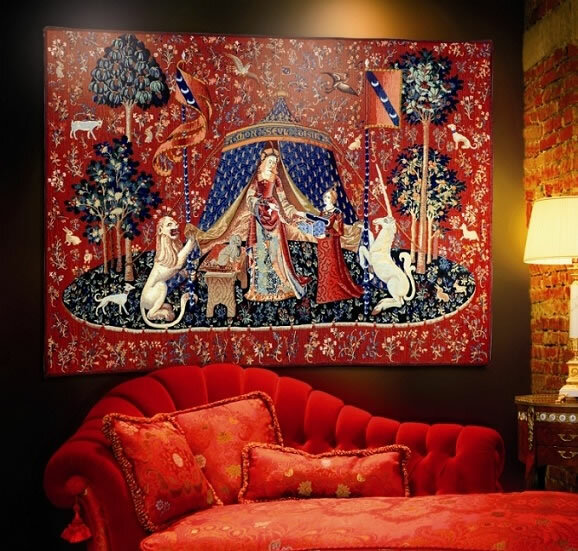 This tapestry is one of the series of six pieces which form the set of the ‘Lady with the Unicorn’, which are undoubtedly the finest works of textile art which survive from the Middle Ages. The theme of the set is the depiction of the five senses, a subject also occurring in other medieval works of the period. 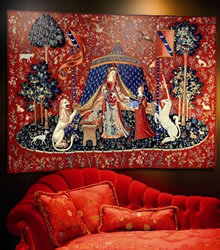 The sixth tapestry is thought to have a deeper meaning and possibly represents a culmination of the senses. The dark blue rounded ‘island’ which serves as the base for the scene, is covered with flowers growing on it, whereas the main background is scattered with flowering branches. 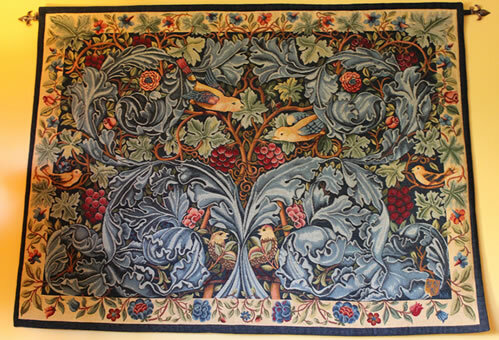 This décor, which was very popular in the fifteenth century tapestries, was possibly inspired by the custom of strewing the ground with cut flowers on fête days. 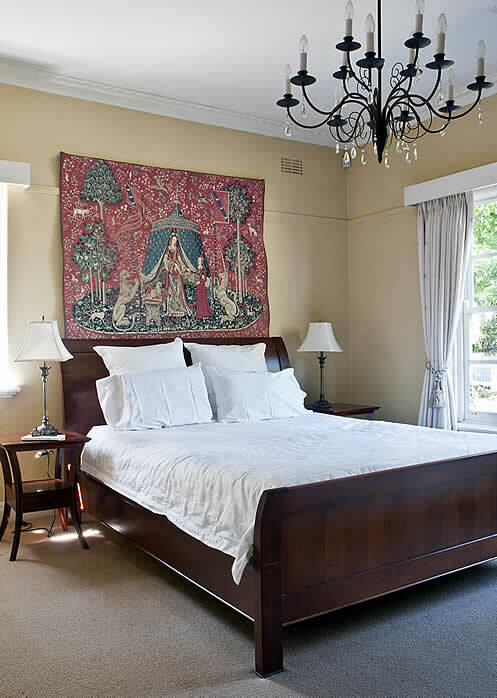 The coat of arms that appears on the standards and the flag on top of the tent, are those of the Le Viste family, who originated from Lyon and moved to Paris, where various members assumed important functions in the Royal administration under Parliament. It is thought that this tapestry was woven for Jean Le Viste around 1490; the originals are very large and would have taken several years to complete. 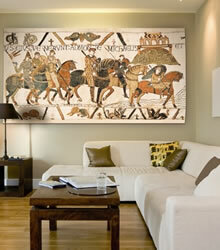 The original series have been on display at the Cluny Museum in Paris since 1882. 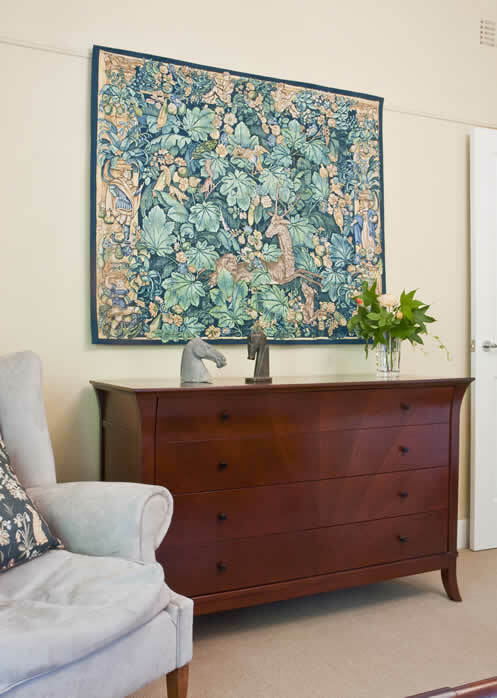 Our reproductions come in various sizes and accessories including cushions, purses, caskets, bells pulls and more. Our products are made from the finest materials and loom woven on Jacquard looms – the traditional method of weaving tapestries since 1804. 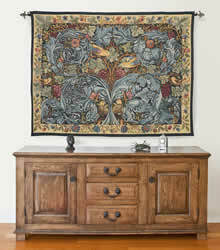 Hand-woven and silk screened tapestries are also available in these designs. 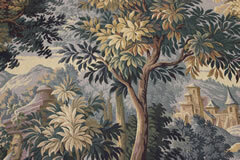 Classic Tapestries has an extensive range of over 200 designs of Medieval "Mille Fleurs". 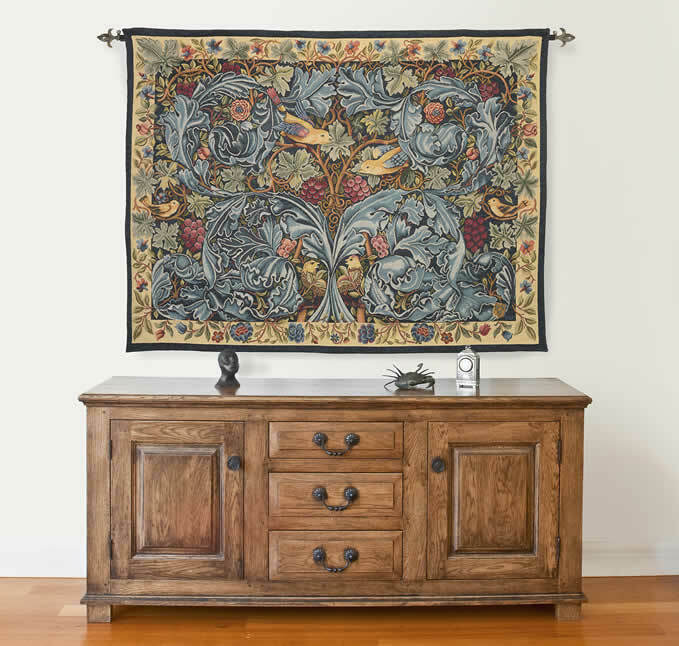 This fine and elegant tapestry was originally designed and woven by William Morris in 1879, and was the first tapestry he produced. 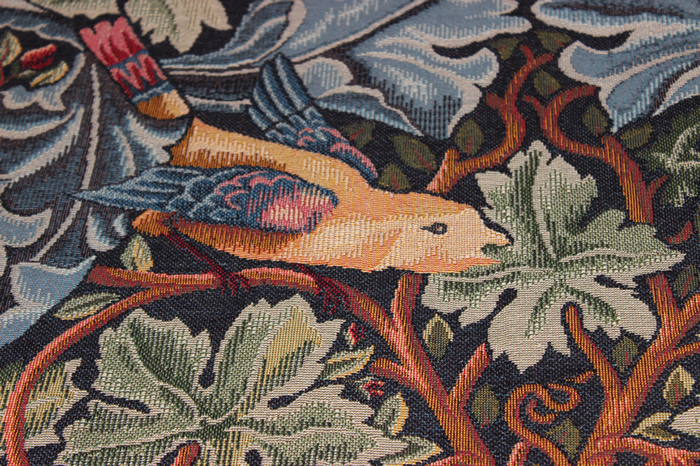 From studying an old French Arts and Crafts manual, Morris taught himself the technique of weaving, and spent many hours weaving this first experimental tapestry by hand in his bedroom at Kelmcott House in Hammersmith, London. 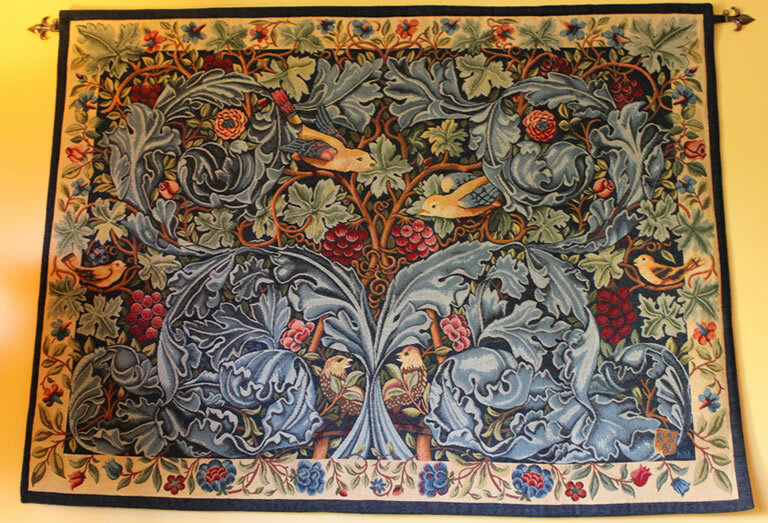 Morris thereafter taught his workmen the technique, and is thereby attributed with reviving the craft of tapestry-weaving in England during the last quarter of the 19th century. 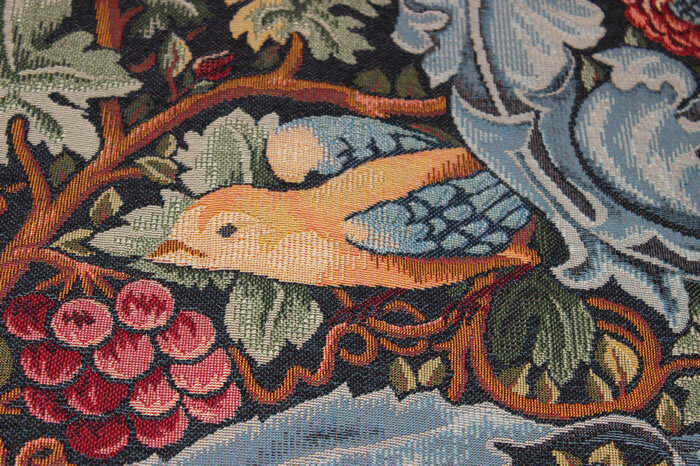 William Morris (1834-1896) is well-known as the founder of the firm of Morris and Company, whose workshops became established at Merton Abbey in Surrey. 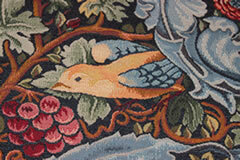 The original tapestry may be seen at Kelmsott Manor in Oxfordshire, England, the one-time family home of Morris. 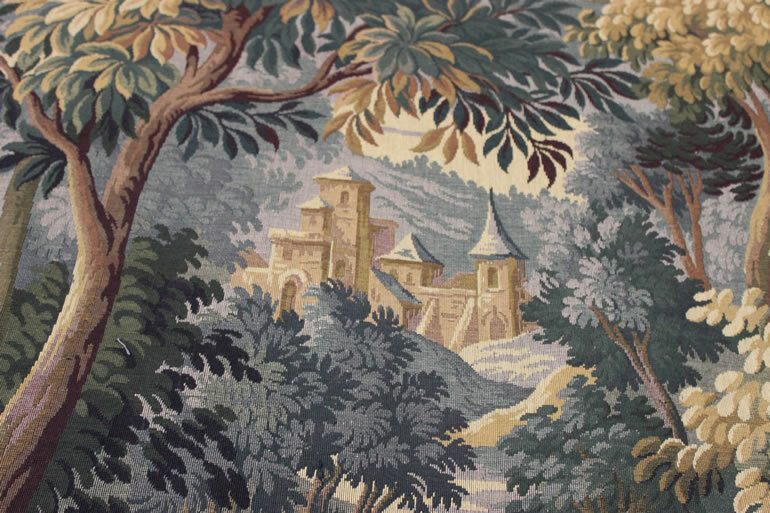 The style of tapestries in the 17th Century became more realistic and often illustrated landscapes with architectural features such as castles and bridges.